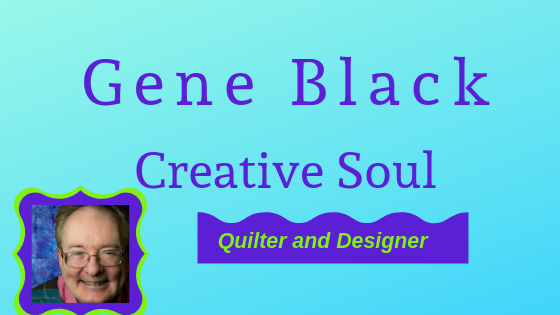 Today I have a guest post from the person who really started the Quilt Angels project. I was lucky enough to be available and have the knowledge that y'all are some really great people. The team effort really succeeded. Not everyone who worked on this contributed a quilt. Some of you contacted friends knowing they could help. One kind soul donated a prize to use as an incentive. (actually two kind souls did this, the letter writer contributed one of the prizes. Here is the letter from our "Chief Angel" including a prayer at the end. Sitting here this morning sipping coffee, contemplating the events of this wonderful Christmas, I realize just how Blessed and fulfilling this Christmas has been. Not the least of these Blessings has been the outpouring of total strangers for a purpose that I happened to learn about by happenstance. Sunday before Thanksgiving, I was sitting at a table in the dining room of our Church talking with Shelia, a close friend and the cook for Sunday morning breakfast at church. We were talking about what we were doing for the holidays, our family and friends gatherings when a couple of other lady friends joined us and we laughed and chatted for a bit. Two of the ladies got up and went on to choir, leaving myself, Shelia and Ms. Maggie. The conversation lagged as we drank our coffee. Ms. Maggie asked Shelia what was needed at the shelter. Shelia said as always they needed funds. She thought for a moment then said that they could use new afghans as the ones they had were getting awfully worn out as the kids liked to wrap up in them during cold weather. As Shelia finished speaking, the call for Sunday School came, so I collected by stuff and went to class. Over the Thanksgiving holiday, I kept thinking about the need for wraps at the shelter. I am only an amateur photographer in my off time, and a paper slinger the rest of the time! I was not sure how to go about this thing. 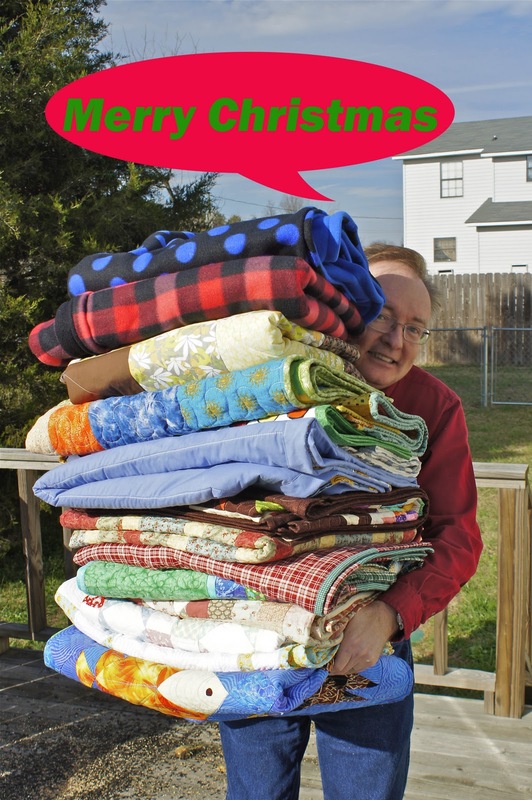 So the weekend after Thanksgiving, my friend Gene and I were having coffee and knowing that he quilts, I asked him about making several lap quilts for the kids in the shelter. He asked how many were there. I told him I had found out they had eight kids. He said he wanted to help, but did not have the time to make eight quilts and make his other obligations too. But he would make two! After a couple minutes of silence, he said he would ask his online quilting friends if any wanted to contribute. I said I would pay him for the quilts and to see what his friends wanted for a few more. He called me a short while later and told me that several of his friends wanted to donate quilts, and instead of paying him for them simply to put up a prize for those who wanted to participate. I agreed. So he posted on his blog the need for a few Angels. Then the most wonderful thing happened... he called me later in the weekend and said that several quilts had already been promised. I was totally surprised and elated that total strangers were willing to donate their hard work and time for someplace and someone they didn't even know. As I sat back and regained my composure, I reflected on this and came to the realization that in our fast pace life, we tend to loose site of the fact that there are still people around us who have soft and caring hearts and are more that willing to help when the need arises. The final total for quilts was 16! The Ogden House was very appreciative for the donations. I have been totally blown away by the response, the caring, encouraging comments, thoughts and prayers from each of you and wanted to express my Thanks to you for being the major players in making a bunch of kids really excited this Christmas. And a special thanks to each for lifting this old heart of mine by showing the true Spirit of Christmas has not been lost. God Bless you, each and everyone for your bountiful gift. And may I add an Amen. Blessings to you all. Here is the rest of the story as promised. 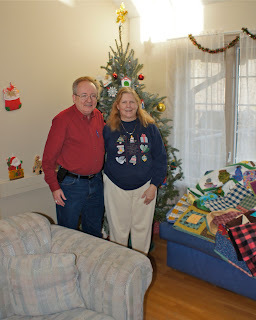 On Christmas eve, we went to the shelter to deliver the quilts. Most of the resident youth had gone home for a Christmas visit. However, there were a couple of youth there. Sorry, but there are no pictures of them due to privacy issues. There are some pictures of me with Ms. Jackie, who was working that day. I have to say that meeting Ms. Jackie was a true delight. Her face seemed to light up and glow from within. And we did the drawing for the prizes. The winners have been notified. Thanks to all of the people who supported this effort. The audio is low in this video, but I hope you can hear what Ms. Jackie says. Don't you love the joy Ms. Jackie shows in receiving these for the shelter? As you might have noticed, her smile is contagious. I watched this and realized that I grinned the entire time. While you didn't see the residents, let me tell you. They were thrilled too. Each one that was there got to pick the quilt for their room. I loved it when one of them wrapped the quilt around herself. One read the label and was amazed that the quilt came "all the way from Virginia." As Charlie said in that old television show "Thanks Angels!" We delivered the "Angel Quilts" on Christmas Eve (yesterday.) Before we left, I had a picture taken of me holding them. (that is a heavy load, I was ready to put them down.) I edited the picture to add a special message for you today. There were sixteen quilts total. All of them are not visible in this picture, although I have every one of them in my arms. These brought great joy. I will tell you the rest of the story in the coming days. The video didn't work out. (earlier post.) 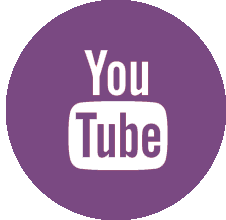 So here is a link to the audio file. Little Gray Donkey. I may have slightly overdone the reverb when I was editing, sorry. If you want to keep the file, right click and then click "save as" or "save link as" and you can download the file. Merry Christmas; God Bless us every one! One of our traditions is to give gifts on Christmas Eve as we tend to be pretty busy visiting all the loved ones on Christmas day. This happens right on the heels of a midnight Christmas service where I am quite busy in the choir. Which means that not only was I awake, but I had to stay alert too. So here is a picture of me with two of my Christmas presents. Actually they both are quilting related. Yes I will explain. That lovely orange iron is the Velocity V50 which you can get at IHAN. The shirt I am wearing in the photo was actually ironed with it. (I almost never iron clothes! cloth yes, clothes not unless I have to iron them.) This iron could change that...but don't hold your breath. This iron steams wonderfully. We are talking super steam. On the two highest settings the steam is so fine you don't see it, but you can feel it. mmmm wrinkles can't resist the force of it. 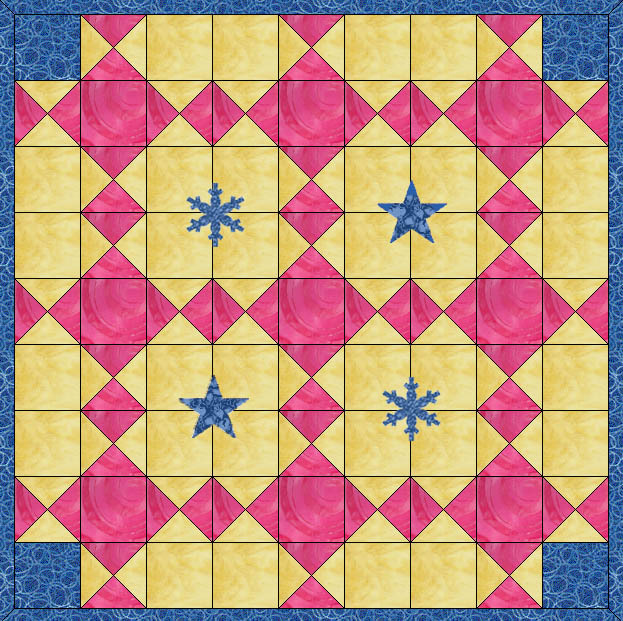 Okay, I don't have to explain that one for quilting, do I? fabric has to be ironed to cut neatly. The other is Parallels desktop for my new iMac. It will allow me to run Windows from inside the Mac OS -thus I can run Electric Quilt - Ahhh....I see that lightbulb went off! I can hardly wait to install it and try it. I am truly blessed. I hope you are blessed and happy during this holiday season, which will pass too quickly. If I post again, it will be to put up a video that could be a blessing or a curse. Ha ha...why? Because I plan to sing a Christmas song for you. We will see how that goes...if you see it, I did it and it worked....if not, know I spared your ears some agony..
Let me begin by showing you a couple of fun pictures. These are some really old, but still working, sewing machines that I saw the last time I went to Mexico. I just now ran across the pictures so I decided to share them with you. Both of these machines were still being used in a shoe repair shop. I was just fascinated to see them. I asked the shop keeper if I could take photographs. He smiled at me, waved broadly and went back to his customer. I think these were the best pictures I got on that trip. Today, I was headed to a friend's house for some Christmas visiting when I almost passed by a fabric store. I swear my car changed lanes all by itself and pulled into the parking lot. What else could I do but go in and look? There are seven yards of fabric, one is a Martha Negley by Westminister fabrics, there are a couple that are Free Spirit fabric, some Timeless Treasures....all GOOD quilting quality fabric. My total bill was ----are you sitting down??? - - - good....My total bill, including sales tax, was a whopping $11.82 -after I got home, I discovered that one of them was only ninety-nine cents a yard. I finally got a new computer, an iMac, so there is a learning curve. I think I will like it once I get used to it. I used two AccuQuilt Go! dies to cut the trees: GO! Equilateral Triangles and GO! Isosceles Triangles Everything else was cut by hand and embellished with a wavy blade on my rotary cutter. Isn't this a fun project? My supervisor loved it. I have to say that quilting folks are amazing. The call for angels has been a success. I am still expecting a few more quilts, but I had to share today's joy. I will not post pictures simply because I can't right now. (sigh) However, you can see two of the quilts on a post at Patchwork Times. I will tell you that the pictures do not do these quilts justice. The one that I am calling Scrappy Stars (at the bottom of Judy's post) is much more glorious in person. I liked it in the picture, but in person WOW it pops. I can't wait to see someone smile when they get this one. I also got quilts from an anonymous donor, Linda at Stray Stitches, and there is a quilt from Barb Sherwood in Virginia. Thanks my angels! These quilts are just amazing. I am taking great joy in admiring them in the brief time I will have them. I knew it already, but I have to say it again: Quilters have heart! Okay, so let's get the bad news out of the way first. My computer is still messed up. I will spend Sunday night trying (one more time) to repair it. Now the good news, the fun stuff! The Searching for Angels quilts have started to come in. One of the two that showed up came from Alamosa Quilter. You can read about it on her post here. Thanks Lynn. 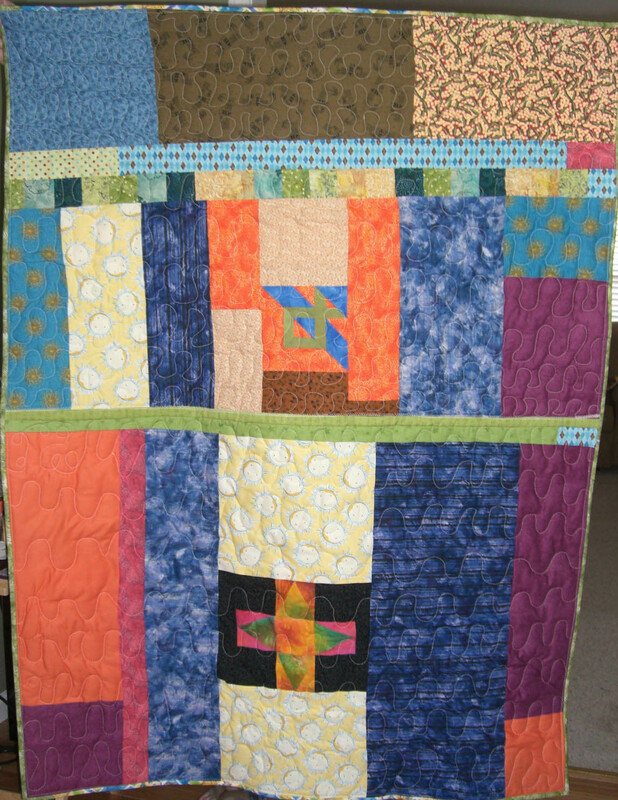 It is gorgeous and I will try to take and send you a good picture of the finished quilt for your archives. I also got a quilt from KwiltNoob - she said it was one of her early quilts. Hmmmm.. Maybe I should just quit! It is lovely. I will not post pictures of all the quilts that are sent, mainly because I won't have time and still get everything done before Christmas. I did promise to make two quilts for this project. I have finished the first one and here are pictures of the front and back. I am calling the scrappy, wonky side the back. I do like to do a scrappy back. The actual blocks on the back are some I just tried with no plan to use them. Then there is a strip of small squares that were left over from a trip around the world piece I did. If I can avoid it, I don't waste anything. I am calling the organized symmetrical side the front. I confess that it is less than perfect, but it is full of love, prayer and hope for whoever snuggles up under it. 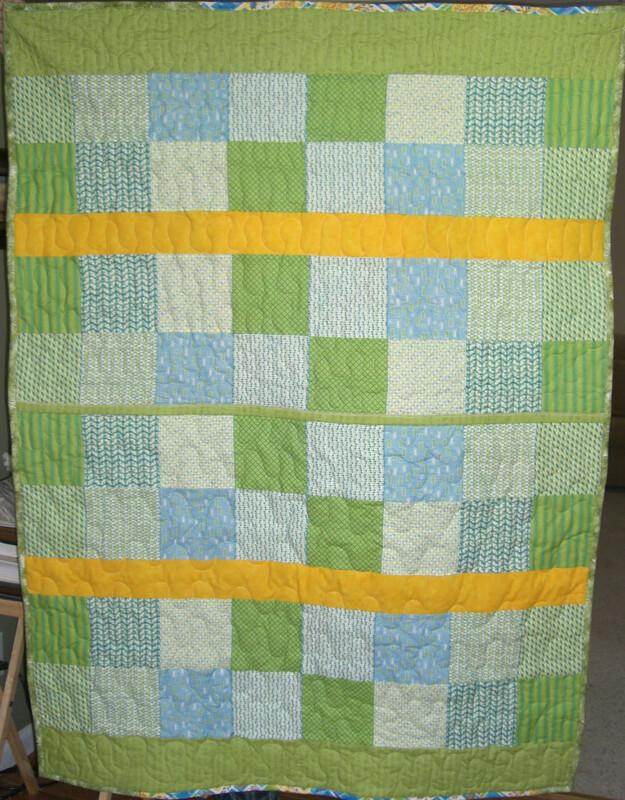 I don't know if you can see in this picture but I did a scrappy binding using two leftover bindings I had lying around I think that adds to the fun of this quilt. Have a great day and remember to tell someone that you love them. This is a short and sad post. I turned on my computer yesterday morning to get a strange message that "Windows can't start because...." It wasn't one I was familiar with. So I improvised using my iPad and managed to do a few things. Last evening (when I was supposed to be working on a charity quilt) I sat most of the evening trying to fix the problem. I used my iPad to do the research. Luckily I have a small partition on my computer with a Linux operating system. That allowed me to replace some files. I can now get to the desktop...but the mouse and keyboard don't work. Tonight...more attempts to fix it. So if I don't comment on your blog or if I seem hopelessly missing...I am just still trying to fix this @#$#^*! computer. If you saw my earlier post "Searching for Angels" then you know that I am working on a service project. I have never really known how much JOY could come from something like this. I saw a post on FaceBook that led me to a post by Lyric Kinard. 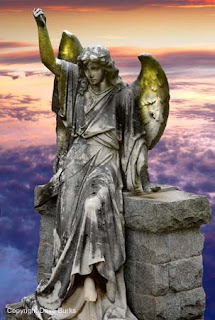 So I have added a button on my sidebar that links to the Angels project. I have truly found the beauty and joy in my quilting friends. I never knew I had so many amazing readers and friends. You have all done me very proud so far. This project has expanded a bit so that the shelter can have a stash of quilts in the closet. If you have questions, first read the previous post, then email me if that doesn't answer them. And if you can't help, it is okay. But if you can, I truly appreciate it. This project is OUR project now, it is definitely bigger than I am. 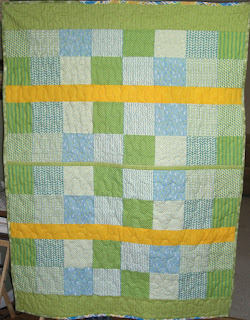 I will be posting pictures of the quilts I make as I get to the point where I have them "photo ready." Peace be with you all. I am blessed to have you. I have a Christmas/Holiday project that was asked of me too late. There is no way that I can accomplish what is needed AND do everything I have to do before Christmas. Here is the deal: I need 8 lap quilts for a shelter. This shelter is a safe place for children ages 12-17 that are temporarily displaced from their families or are deemed a child in need of services, not "juvenile delinquents.” Youth participate in activities that will increase their knowledge of life skills. Some examples of life skills training they receive will include chores, cooking, budgeting, and other independent living skills. 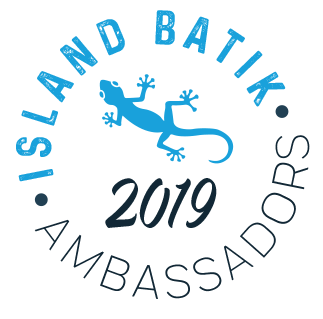 The children also volunteer and perform community services work while in the program and attend public schools to continue their educations. I know some of the people who work for this shelter and it is a wonderfully run facility. I am looking for some ANGELS - yes it could be you -who can make (or one you already have made!) 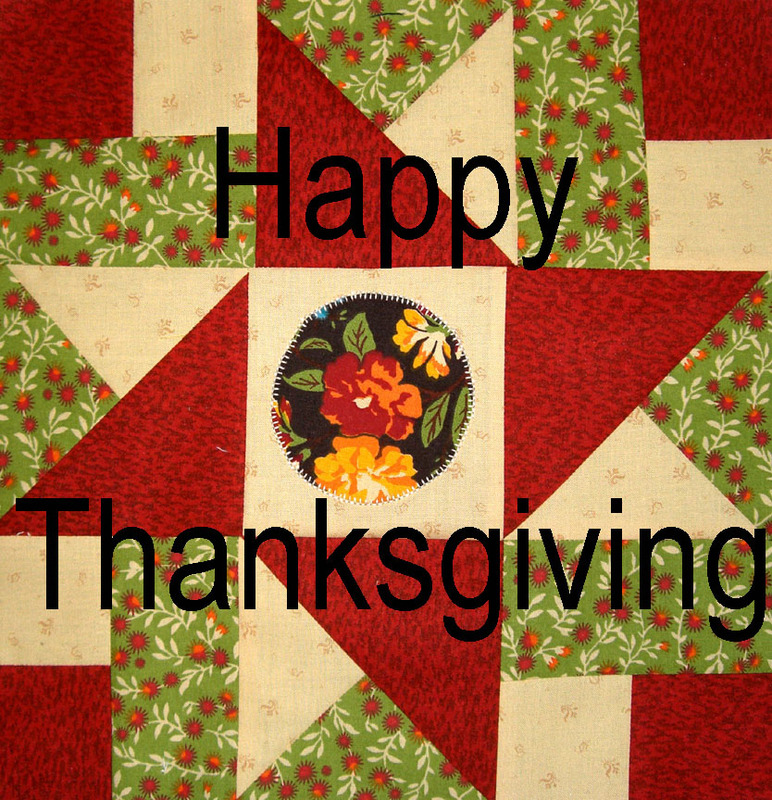 and send one lap quilt (or more if you can) and get it to me by December 21st (in time for Christmas.). 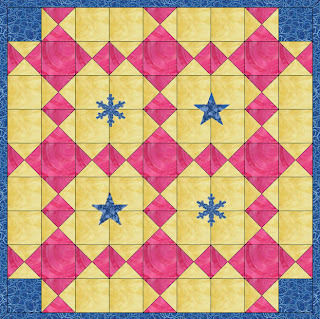 I have a non-quilting ANGEL who is offering a prize -to be drawn from those who send a quilt. This prize will be a $100 gift certificate to an online vendor. (I am thinking Connecting Threads, Fabric.com someplace like that - maybe I can even let the winner choose!) I will have to have six quilts sent in order to be able to offer this prize. The drawing will be held as soon as possible after the quilts are delivered - I am thinking December 26th. I would like the lap quilts to be at least 45 by 60, but a little bigger would be better. Fabric should be gender neutral as the shelter houses both boys and girls and the ratio changes. As these are teens, bright colors will probably be best, but I will leave it to your discretion and wisdom. As for pattern, your choice, I don't mind if it is simple, we do have a short deadline. Please insure that these are sturdy as I am sure they will get lots of use and washing. Binding by machine is fine -and faster! I am hoping that I can make a couple of the needed quilts, however, the shelter can always use extras for new children coming in. I will take as many quilts for this project as are offered. Those that arrive by December 21st will be entered in the drawing. Okay ANGELS, I know you are out there. Can you help? Comment to let me know if you can help and be sure I can contact you by email. I thank you for considering this. This is a painting that I did of my Dad several years ago. I did the initial sketch in a hospital waiting room. Mom was extremely ill and we really thought we were going to lose her. It was a rough time emotionally. Sketching helped to occupy my mind so I could stay sane. Dad had dozed off so he was nice and still for the sketch. When I did the painting, I wanted to retain the sketchy loose quality. So I mixed a blue gray color. After the painting was finished, I had it matted and framed. I presented it to Mom and Dad. It was immediately hung in the living room where it is to this day. I am truly proud that I captured Dad's likeness. In case you are wondering, he wore a cap more than he went without one. He had a large number of caps. I am also glad that he was wearing a cap in this sketch/painting. I have to say that I have been missing him and thinking a lot about him lately. I love you Dad! Rest in peace.